I am having a bit of a closet issue. Again. It happens every time I switch my summer clothes for winter (or winter for summer), even though I purge my wardrobe with the changing seasons. It's true that I have a healthy selection of clothing and just a few pairs of shoes, but I don't consider myself over the top. Chris says the solution is to just get rid of several pairs of shoes but I am pretty sure that's a silly idea. The problem is just lack of closet space and most of all, poor organization. 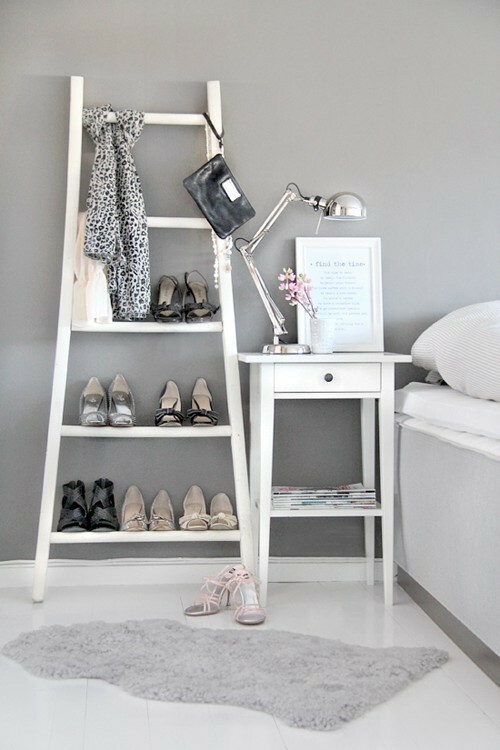 I dream of a time when all my clothing and shoes will be in the same place. Currently my clothing is split between our bedroom closet and Eloise's bedroom closet, most of my shoes live in E's closet and a few more are on an over the door rack in our pantry (random, but it's the only spot Chris would let me hang it). It is not the ideal situation and frustrating when I am trying to remember where that certain pair of shoes might be as I rush out the door. Believe me, I am well aware that a plentiful collection of shoes is a good problem to have. I would love to keep some of my fancier shoes on display in our bedroom, but Chris actually laughed out loud at this idea. He followed up by saying, "does this mean I can display my soccer cleats?" No, it doesn't. 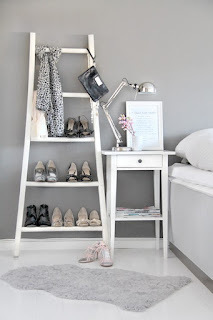 Have you seen crown molding used for shoe display? I think it's a very cool way to use vertical space. 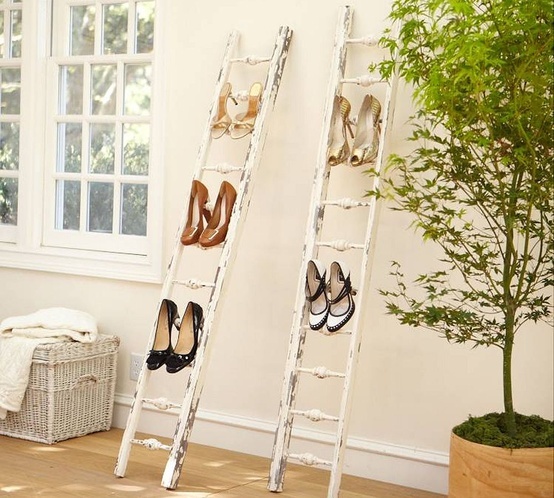 Or a vintage ladder or leaning ladder bookshelf for a smaller space shoe display option. And, this one I couldn't resist. A girl's gotta dream, right?